GSP saved American companies a record $1.03 billion in 2018, smashing the previous high of $894 million set in 2017. However, less than 40% of GSP benefits came on products where there is no an immediate risk of losing GSP. Read more here. The $1.3 trillion omnibus spending bill signed by the President on March 23, 2018 averting a government shutdown, includes language renewing a federal trade program that saves U.S. companies millions of dollars. The language renewing the Generalized System of Preferences (GSP) was passed by the U.S. House of Representatives in February 2018. A three-year renewal of the Generalized System of Preferences program is included in the major omnibus spending bill released on Wednesday, March 21, 2018. GSP waives duties on thousands of goods from developing countries to promote economic development and jobs. The GSP program expired at the end of December, costing importers $77 million in taxes in the month of January alone, according to the Coalition for GSP. However, any duties collected since Jan. 1 will now be reimbursed. In the evening of February 13, 2018 the U.S. House voted 400-2 to pass H.R. 4979, bipartisan legislation providing a three-year retroactive renewal of the Generalized System of Preferences program. GSP is a longstanding U.S. trade preference program that delivers tariff relief and cost savings to American businesses, workers, and consumers across the country. The issue now is expected to be addressed in the U.S. Senate in March. GSP saved U.S. companies $619 million in the first eight months of 2017, about $83 million more than in 2016. California has received the most savings—more than any other state. In 2016, GSP waived tariffs in California on $3.2 billion worth of imports and saved California companies $119 million. Of the $729 million saved by American companies in 2016, more than 16.3% went to California. On January 4, 2018 nearly 400 U.S. companies and associations (including the California Chamber of Commerce) sent a letter to House Speaker Paul Ryan, Senate Majority Leader Mitch McConnell, House Minority Leader Nancy Pelosi, and Senate Minority Leader Chuck Schumer urging swift, retroactive renewal of the GSP program.GSP expired on December 31, 2017 and companies must now pay $2-3 million per day in extra taxes while awaiting a potential congressional reauthorization. The last time GSP expired, Congress did not renew it for nearly 2 years and companies paid about $1.3 billion in tariffs. Despite broad, bipartisan support in both the House and Senate, GSP renewal did not get a vote in 2017. In January, 2018 a White House official reportedly said the Trump Administration supports a three-year GSP extension and would like to see Congress act “this this year” (2018). GSP was last reauthorized on June 29, 2015 (effective July 29, 2015) for a period of two-and-a-half years. The program is set to expire on December 31, 2017. The CalChamber is among 661 American organizations that sent a letter to congressional trade leadership, urging retroactive renewal of the Generalized System of Preferences (GSP) program. Just a few days after the letter was sent, GSP was reauthorized. The Generalized System of Preferences provides special tariff preferences for imports from the less developed countries into the advanced industrialized countries. The idea of such preferences was first formally proposed at the 1964 United Nations Conference on Trade and Development (UNCTAD I). This conference focused on the theme that trade, as opposed to aid, was the most effective vehicle for promoting Third World economic development. In 1968, some headway was made at UNCTAD II, when the United States and other advanced industrialized countries supported a resolution to establish a mutually acceptable system of preferences. A barrier to such a system was the most favored nation clause of the General Agreement on Tariffs and Trade (GATT), which provides that trade be conducted on the basis of non-discrimination. To permit them to grant preferences to less developed countries, the industrialized countries requested and received a 10-year waiver from the requirement on June 1971. The implementation of 14 Generalized Systems of Preferences (GSPs) followed: The European Community (July 1, 1971), Japan (August 1971), Norway (October 1971), Denmark, Finland, Ireland, New Zealand, Sweden, the United Kingdom (January 1972), Canada (July 1974), and the United States (January 1976). The 10-year waiver was later extended by the GATT and adopted by the WTO, with the result that the industrialized countries can extend their GSP programs indefinitely. 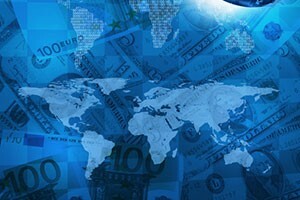 The U.S. GSP is authorized by Title V of the Trade Act of 1974 and instituted on January 1, 1976. Under the program, the President designates countries and products eligible for duty-free treatment. 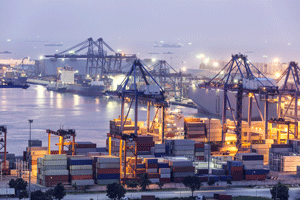 Products determined to be import-sensitive are statutorily exempt. GSP was most recently reauthorized on June 29, 2015 (effective July 29, 2015) for a period of two and a half years. 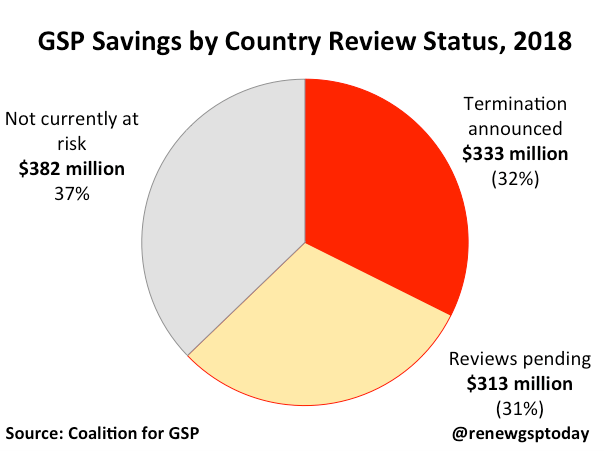 According to the Coalition for GSP, the renewal alone led to about $1.3 billion in refunds. GSP is an important tool for boosting economic growth and job creation. Many U.S. companies source raw materials and other inputs from GSP countries, and the duty-free treatment of these imports reduces the production costs of these U.S. manufacturers, making them more competitive. According to analysis by the Coalition for GSP, approximately 82,000 jobs are either directly or indirectly associated with the importation and use of GSP-eligible imports. Products eligible for duty-free treatment under GSP, according to the Office of the U.S. Trade Representative, include most manufactured items; many types of chemicals, minerals and building stone; jewelry; many types of carpets; and certain agricultural and fishery products. The California Chamber of Commerce, recognizing that the Generalized System of Preferences has stimulated two-way trade with the United States and has contributed to the long-term economic development of some developing countries, supports annual extensions of the Generalized System of Preferences.